Abstract: This time around, Noctua nickel plate all copper surfaces and bundle in the super quiet NF-B9 fan - and it's not your average vaneaxial fan either. The Noctua NH-U9B is a refined take on the previously successful NH-U9 heatsink. This time around, Noctua nickel plate all copper surfaces and bundle in the super quiet NF-B9 fan - and it's not your average vaneaxial fan either. The NF-B9 is a flesh-toned fan with three key innovations; SSO bearings, vortex-control notches, and textured leading impeller surfaces. That translates into a fan which is very quiet at a speed of 1600RPM, and with two in-line resistors its rotational speed can be further reduced without impacting temperatures too dramatically. That's all well and good, but you probably want to know if Noctua's NH-U9B is one of the few heatsinks able to break away from the "low noise handicap" and perform more like a performance cooler? In other words, is it good? Noctua's NH-U9B heatsink stands 120mm tall, 96mm across and can accommodate one or two 92mm fans. In Frostytech's tests, a single 92mm fan more than sufficient for the job. Noctua ship the cooler with a single NF-B9 92mm fan, mounted to the heatsink with wire clips. 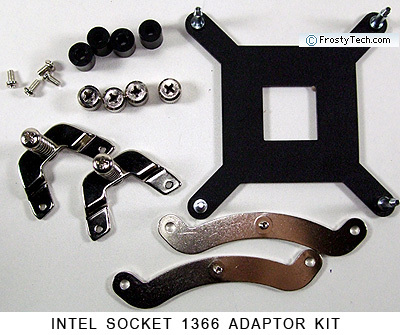 All the necessary CPU mounting hardware is included for Intel LGA775 and AMD 939/AM2 processors. The nickel-plated aluminum cooling fins are connected by four nickel-plated copper heat pipes to a nickel-plated copper base, and the total weight is a moderate 460 grams. Compared to the previous model of the same name, the Noctua NH-U9B heatsink incorporates a few cosmetic improvements. Namely, the heatpipes and copper base in this model are all nickel plated, and every metal joint is soldered. Soldering decrease thermal joint resistance between the fins and heatpipes, or heatpipes and base. The Noctua NH-U9B accommodates 92mm and 80mm fans, and comes with an extra set of wire clips so two fans can be mounted. One of the main selling points of Noctua's heatsinks are the specialized low noise fans used. The Noctua NF-B9 fan incorporates double notches (see below) on the trailing edges of each impeller called vortex-control notches. These break up trailing edge vortices into several smaller vortices which ultimately cause noise to be spread over a wider range of frequencies and less perceptible. Special SSO bearings are used in the motor housing. It also helps that the NF-B9 92mm fan rotates at a leisurely 1600RPM. To further reduce noise from the heatsink, Noctua provide two in-line resistors which drop in between the fan and motherboard. A black colour-coded resistor reduces fan speed to about 1300RPM, and another (blue) to about 1000RPM. The blue connector makes the Noctua NH-U9B heatsink operate in its most quiet setting, about 32 dBA in our real world tests. Noctua's NH-U9B heatsink is compatible with Intel socket 775 and AMD socket 754/939/940/AM2/AM2+ processors. Small metal tabs are attached to the heatsink base, a backplate positioned behind the motherboard, then everything fixed in place with spring-tensioned screws. The installation process is straight forward, but you may have to remove the motherboard from the computer case which is never fun. A multi-language manual provides guidance, and a special screwdriver is even included. As always, we'd recommend orienting the fan towards the rear of the PC case. One of the nice aspects of this heatsink is that Noctua has released a new mounting kit to make it compatible with Intel's Core i7 socket 1366 processor! 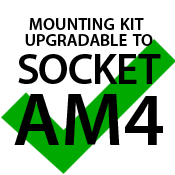 The Noctua SecuFirm2 mounting kit works with any Noctua CPU heatsink going back to 2005, and best of all it's available for free from Noctua's website. Socket 1366 processors use slightly wider spaced motherboard mounting holes for heatsinks to attach to - 80mm vs. 72mm for LGA775 chips - so existing socket 775 brackets are not compatible with this new Intel CPU in spite of the fact the heatsink is probably still well suited. The Noctua SecuFirm2 bracket (shown above) uses spring tensioned screws to securely mount the Noctua heatsink on the new Core i7 processors, and ensures optimal contact pressure thanks to identical Z-height between LGA775 and LGA1366 CPU formfactors. Frostytech will be testing this Noctua heatsink shortly to see how it performs with socket 1366 processor thermal demands... stay tuned! The Noctua NH-U9B heatsink has a machined nickel-plated copper base with a surface roughness of approximately ~48 microinches. The manufacturer has purposefully given it a ridged texture. The base is very slightly concave when examined with an engineers straight edge. Screw holes at each corner allow the mounting brackets to be attached.